I wrote about Chef Didier Corlou before (see article "Chef Didier Corlou, A Passion for Pho and Vietnamese Cuisine".) because I very much admire his tremendous knowledge and passion for Vietnamese foods, and for pho in particular. Recently I had a chance to interview the "Maitre de cuisinier de France" himself over email. Chef Corlou is a very busy man so I'm honored to have him spend some time to share his views on Vietnamese and French cuisine, his view on the state of pho, and his new culinary ventures. First a little bit more about Chef Corlou. In a sentence, Chef Corlou's resume could be summarized as noted on his homepage of didiercorlou.com. After over 30 years of experience worldwide – in Africa, Asia, Europe and America – and 14 years as Chef of Sofitel Metropole Hanoi, I now offer you a variety of buffet, diner and cocktail menus, with exotic-themed or European, traditional or contemporary dishes. 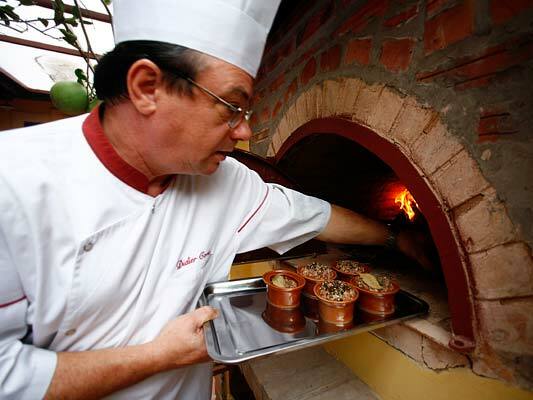 "Le Chef" Corlou is a member of the Culinary Academy France and is a 5 Stars Diamond Award Chef. With extensive traveling, cultural and culinary experience from around the world, Le Chef is now working out of Vietnam, running his new Verticale restaurant in Hanoi, opening up On the 6 in Saigon, while managing a training center and catering business. Here's a Didier Corlou bio. 1956. Born in Henebont, France. 1976. Africa, the Big Start: discovering of Ivory Coast and its lagoon from Abidjan. 2009. Guest Chef at Diner de gala Escoffier, Shanghai, China; Guest Chef at TRU Vietnamese and Thai, Hongkong; Guest Chef at Ikarus in Hangar-7, Austria. Chef Corlou has recently received the “Star Diamond Award” from the American Academy of Hospitality Sciences. Let's get on to the interview. I use text in brackets [...] to clarify the message as needed. 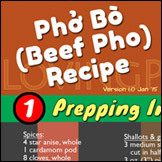 Lovingpho (LP): Do you consider yourself a French chef specializing in Viet cuisine, a Viet chef specializing in French cuisine, or maybe somewhere in between, or competely outside of the range of these descriptions? Didier Corlou (DC): I am a French chef who [is] fascinate[d] in the gastronomy of all the world, and has an advantage in Vietnamese cuisine. LP: What were the factors that drew you to Vietnam in general, and Viet cuisine in particular? 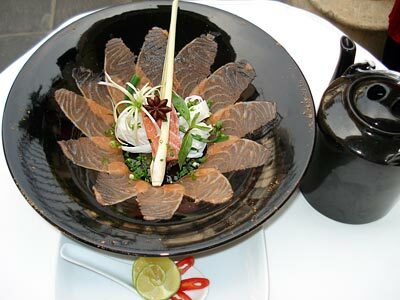 DC: The first reason is to discover, of course, the Vietnamese cuisine. However one more important thing is the habitants. All these factors make me stay with this beautiful country. LP: What were some of the most important factors/ideas/concepts during your training that you deem important/critical for your knowledge and success today? DC: I don’t consider myself a successful chef. However, in my oppinion, the most important factors lie on the way you present your work with a strong will and the desire for learning new things. LP: If you can share some of your proudest achievements at the Sofitel Metropole Hotel, what would they be? 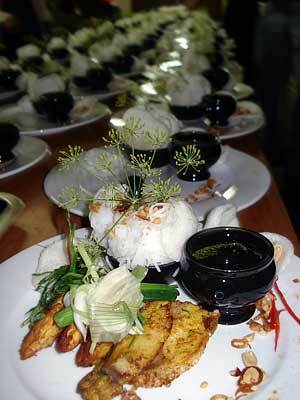 DC: During more than ten years working at Metropole, I am glad that I’ve built up the standard of Vietnamese cuisine. LP: What would you select as some of the most important Viet dish(es)? And why? 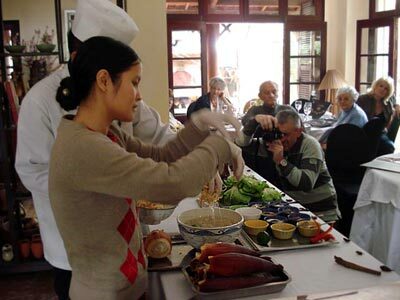 And what are some of your favorite Viet dish(es) you like to enjoy yourself? And why? DC: For me, Pho is the most important and also my favorite Vietnamese dish, because it is very delicious, but not expensive. You can find it everywhere. LP: What would you select as some of the most important French dish(es)? And why? 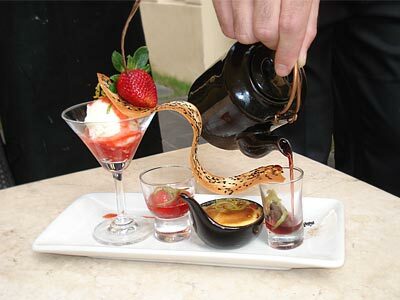 And what are some of your favorite French dish(es) you like to enjoy yourself? And why? DC: It is difficult for me to say which French dish is the most important. Each region has its own regional product and speciality. So it depends also which French region I am standing to answer the question what is my favorite French dish. LP: How many years have you followed pho development, or developed pho yourself? 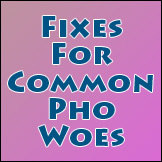 And how have you seen pho changed during this time? LP: What are some of the worst/unacceptable pho preparation techniques that you have encountered? DC: Everyone has own technique but the most important thing to have a good taste of Pho is the broth. In my oppinion, the worst technique is adding the glutamate-Maker of food seasonings [monosodium glutamate] in the broth and I [would] never do it. I make my Pho with Vietnamese spices (Cardamom, star anis...) instead of glutamate. Chef Corlou’s Pho With Salmon! LP: What do you think is the difference between pho in North Vietnam versus pho in South Vietnam today, or are there differences any more? And if so which do you personally prefer? 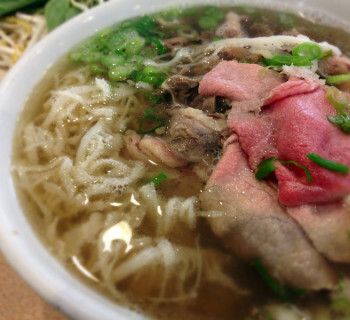 DC: North of Vietnam is the origin, the cradle of Pho. 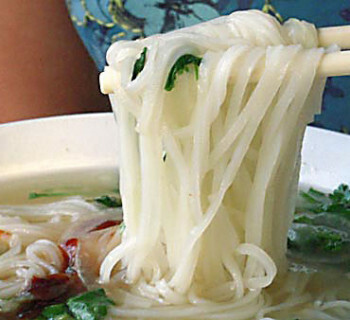 Generally, the Pho of the northern [is] featured by the salty taste, and the South by sweet. And Pho in the South is paired with more herb[s] than in the North. LP: Can you share your thoughts on pho development outside of Vietnam, specifically in Australia, Europe and in the U.S.? DC: Pho is more and more developed not only in Vietnam. There are 2 Vietnamese dishes that I see developing strongly outside of Vietnam: Pho and “Bun Bo” – Fresh noodle with beef. 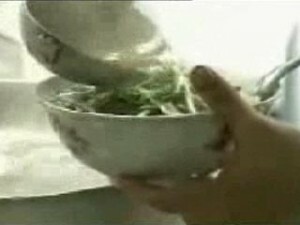 I see in France, there is the “Pho complet” – The Pho with prawn, pork and beef...in a bowl. It is very good. LP: Do you see a problem/issue with pho being developed within Vietnam and outside of Vietnam in parallel, at the same time? Will they diverge into something different? DC: I don’t think the development of Pho is [in any] threat, we must leave Pho [to] progress, we can not put it in the museum. [Everyone] can have his way of cooking Pho [as] he [wishes]. However [even if] Pho has developed to other kinds like “pho cuon”, “pho chua” , “deep fried pho”... no one [should forget] the tradittional Pho. LP: It is difficult for restaurateurs and business people not to jump in to franchise foods that are popular and if there exists a market for them. 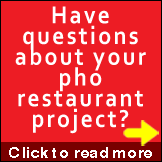 Can you share your views on franchised pho? DC: As you can see, the “Pho 24” is very successful with the franchising. It is no problem if we can market the Pho, but it must follow a recipe. Also, it [still] exists [in] many small restaurant[s] in the street [which are] very popular. I really appreciate that. 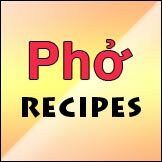 LP: Do you have one and only one recipe for pho, or do you advocate several different recipes? What are your reasons for your preference(s)? DC: I have a basic recipe for cooking Pho. When cooking the “Hanoian Pho”, I respect strictly to this recipe. However, I still create my own style of Pho based on the products [I find]. For example, I can change some spices in the broth but just a little to have a matching between the broth and the products [/ingredients]. LP: Today pho is just fine the way it is for many people. Where do you see pho heading in the future? DC: Pho is for everyone, [anytime] and easy to eat though it takes a long time to cook. In my opinion Pho is a potential [platform] to develop [further]. LP: Given so many types of foods to choose from, how often do you enjoy a bowl of pho? And if you do, where would you go for pho? DC: That’s right we have now many types of foods, but for me one bowl of Pho a week in a small traditional Hanoian Pho street is ideal. LP: Please share with our readers your current endeavors with La Verticale, OnThe6, and your Training Center. I want to continue developing the new Vietnamese cuisine; also, to share my cuisine with people who [are fascinated by] Vietnamese cuisine. I [have] issued the collection “Five [seasonings]” with Vietnamese traditional recipes and modern recipes. The [training] center always has these available. LP: Finally, they say a Frenchman must have wine with every meal. What would you choose that may go well with pho? DC: It is a interesting question! Normally, at the restaurant, it is difficult to have the matching wine with soup. But for the Pho, it is great to have a glass of Merlot red wine before eating but never beer! The red wine will put up the taste of Pho. However, do not drink while eating the Pho. After, the tea is good idea. I'd like to send a big thank you to Chef Didier Corlou for this interview, and also to his assistant Ms. Luong for her help coordinating it. All photos courtesy Chef Didier Corlou.